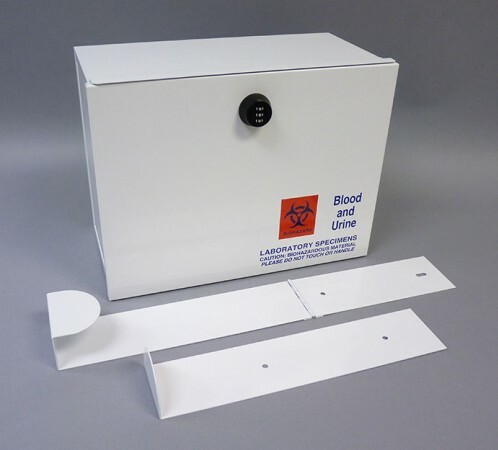 The Therapak metal lock box is available in a variety of sizes and strap options. Each box is made with cold rolled steel for durability and powder-coated white for protection. 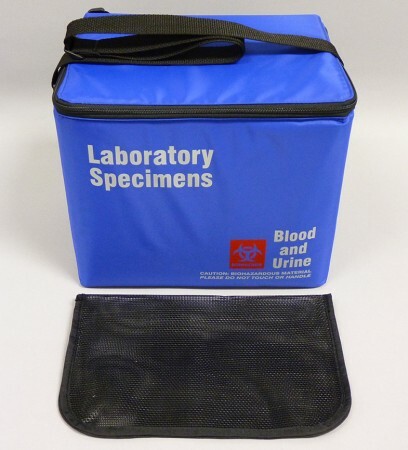 It is insulated on the inside with foam to assist with preserving specimen integrity. A standard-keyed lock with 2 keys is provided with each unit. Customization: Any deviation from the standard configuration, which may include changes in color, size, design features, closure and print. Minimum quantity for custom print is 24 units. Please call us with your individual customization requirements. This metal lock box is constructed of 24 gauge cold rolled steel and painted with a powder coat finish for excellent strength and durability. It is insulated on the inside with foam to assist with preserving the integrity of the specimens. 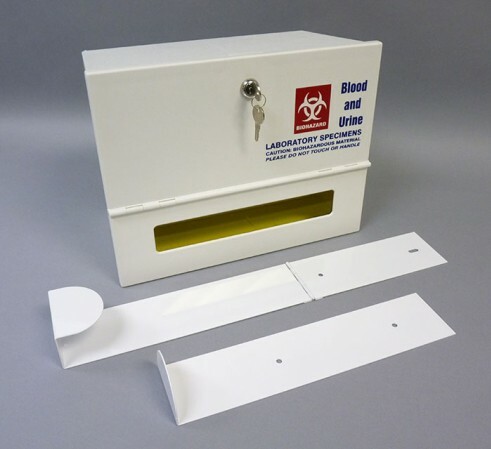 The standard lock box has a hinged front door that rotates down 90° for convenient access and use as a temporary tray. It is supplied with a lock and two matching keys for security. Standard printing: Reflex blue text, red biohazard symbol on front side only. Customization: Any deviation from the standard stock configuration, which may include changes in color, size, design features, closure and print. This sturdy lock box is made of high impact polystyrene (HIPS). Made for hanging on the door using the optional straps, it offers the timesaving convenience of a viewing window and a hinged door that opens down for ease of use. It is supplied with a lock and two matching keys for added security. The ConstanTemp® features an insulated pouch combined with specially formulated gel that holds temperature for extended periods of time. Frozen specimens can be maintained for over 4 hours in 105°F temperatures. Condition the inner gel packs to maintain the specimen temperature desired (frozen, refrigerated or room temperature). 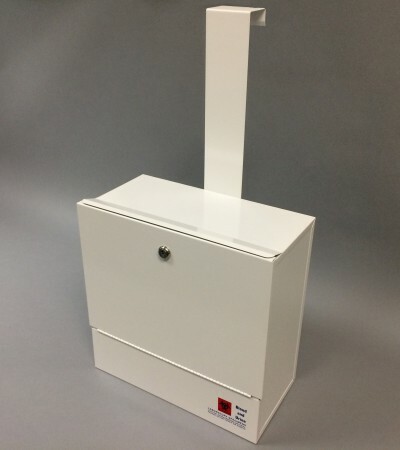 ConstanTemp® is an ideal source of protection for maintaining specimen integrity prior to courier pick up in lock boxes or in courier transit. Note: Each ConstanTemp® includes 2 ConstanGel refrigerant packs. Additional ConstanGel packs can be purchased separately. The fabric lock boxes are available in two standard sizes: small and large (see below for dimensions). Features include a zipper closure, a mesh envelope for gel packs, and an adjustable strap for ease of courier handling during pickup activity. Options include a zipper lock with 2 keys and a steel-reinforced security strap to assure lock box safety during use. Standard printing: Silver text with red biohazard symbol on one side only. Options include: Zipper lock, security strap. Customization: Any deviation from the standard stock configuration, which may include changes in color, size, design features (i.e. number of pockets), closure (i.e., Zipper, Velcro, buckle, etc.) and print. Minimum customization order quantity is 24 bags. Accessories increase the functionality of your lock boxes. 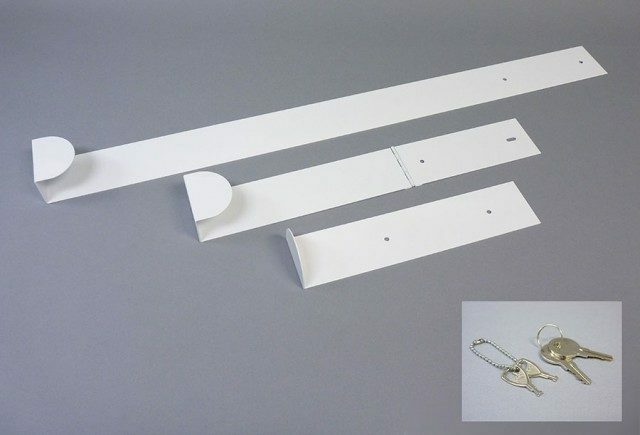 ‘Over Door’ and ‘Under Door’ Straps allow your lock box to be secured outside of a locked office or lab door, giving easy courier access without breaching the security of your building. Extra key sets provide access to your lock box to as many couriers as you choose.